During Lutfur Rahman’s election campaign, strong suspicions lingered about who might benefit from his victory. Certainly, millionaire housing association tenant Shirajul Haque was one name mentioned. After all, I’m told by several sources that he bragged he had underwritten Lutfur’s legal fees during his High Court challenges against the Labour party (something Lutfur himself denies). I suppose Shiraj is a generous soul: over the years he has also given money to the Labour party and offered cash to the Lib Dems. But as with many businessmen mixing in the political arena, I’m also sure he would want a pay back. And nothing would please him more than to regain control of the annual Baishakhi Mela, the cash cow festival attracting 100,000 visitors in Brick Lane and Weavers Fields every May. Control was removed from his a few years ago after council appointed auditors filed a devastating report about his organisation’s lack of financial control. So it will be interesting to see who puts in bids and who wins the tender for two tenders that have just been advertised. One, here, is for the “production management” of the Mela on next May 8, the other, here, is for the “creation of the procession” for the Mela. Expressions of Interest to Quote Contract number: CLC3895 Production Management: A Baishakhi Mela in Banglatown Brick Lane Sunday 8th May 2011 Introduction Tower Hamlets is seeking quotes for the Production Management of the annual Baishakhi Mela event. The Production Manager will be responsible for delivering a coherent event plan and risk assessment, site plans, contracting and managing site crew, site managers and safety staff and procuring site infrastructure for up to two sites. The Baishakhi Mela is an annual event celebrating the Bengal New Year with an attendance in the region of 100,000 people during the course of the day and across three main event sites: Brick Lane, Allen Gardens and Weavers Fields and linked via a series of closed roads. The event is one of the key community festivals in the borough and draws an audience from across the UK but focussed on the local Bangladeshi community. Now in its 14th year, the 2011 Baishakhi Mela will take place on Sunday 8th May. Criteria To be considered for this contract you must have relevant experience of managing similar large-scale outdoor community festivals (e.g. 20,000+ audiences) within an urban environment and have comprehensive Health & Safety documentation. Any company unable able to demonstrate this need not apply. Interested suppliers can express an interest via the Council’s e-tendering system (London Tenders Portal) which is free of charge and must allow sufficient time to register (at least 1 working day). Expressions of interest must be made on the following website: https://www.londontenders.org/procontract/supplier.nsf/frm_home?openForm Expressions of interest must be received by 2pm, 10th December 2010. Late expressions of interest will not be accepted. Suppliers who have expressed an interest will be sent quotation documents after the closing date for expressions of interest. The criteria for awarding this contract will be included in the request for quotation documents. The closing date for submitting completed quotation document is 2pm, 7th January 2011. The Council does not undertake to invite all applicants or bind itself to accept the lowest or any tender. The Council will not be liable for any costs incurred in tendering for this contract. 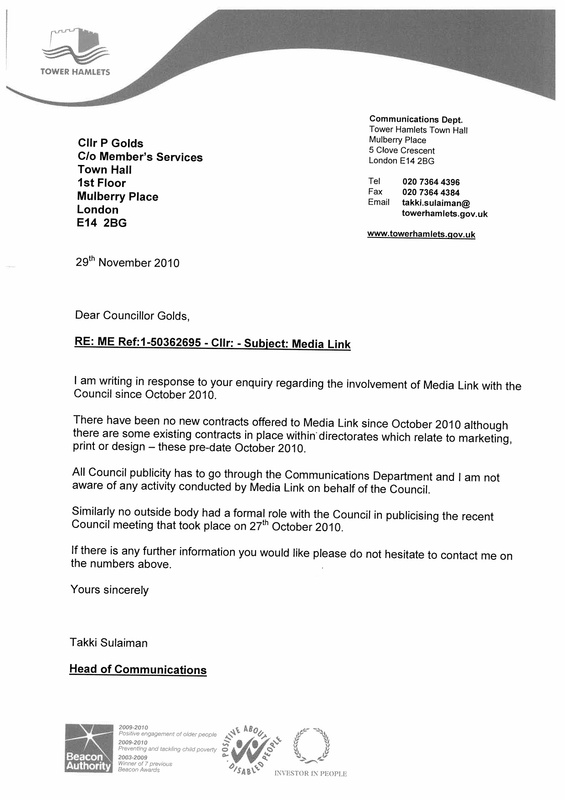 The other organisation whose name was mentioned heavily during of the grinding of the Lutfur rumour mill was Media Link. Many thought it had its eyes on winning more contracts for council publicity – it already has several – and perhaps even the star prize of helping to print and distribute East End Life. A reliable Town Hall source told me some weeks ago that Media Link had upset some council officers by helping to publicise the official Mayor-making ceremony for Lutfur at the end of October. I was told they had been helping with invitations and the like. May I know how many existing contracts the council has with Media Link? May I know how long these contacts have been in place? What they are for and what is the fee? Have any Executive council members, either currently in office or previously been involved in the appointment of Media Link and if so what declarations have been made? In addition I am mystified as to the response to Media Link’s involvement with the last council meeting. I was informed that they were involved. Interestingly, having tabled my question the MD of Media Link contacted me four times on my private mobile number and sought a meeting to discuss “questions I may have”. I am in intrigued as to how Media Link would have any knowledge of my tabling questions on their council related activities? I’ve tried calling Media Link, but the number listed on its website (020 7422 0002) is unobtainable, which isn’t really very good for a bespoke communications consultancy. I would also like to ask its bosses under what name(s) they file their accounts at Companies House…because the only two I have so far found listed at their registered address in Myrdle Street, Whitechapel, are Media Link World Ltd and Media Link Training Ltd, both of which have fewer financial assets than I do – and that’s saying something. Mujib Islam, who owns, Media Link, tells me he did not help with any publicity for Lutfur’s mayor-making ceremony in October. He also tells me that he found it difficult to secure an invite for himself and that it was only when Cllr Oli Rahman stepped in that he gained access. He says he feels distressed at being dragged into the politics of Tower Hamlets and that he is merely a businessman looking to develop a business that has taken 10 years to build. He says that he has not thought about bidding for any contract for East End Life, both because none is currently available, but also because he does not have that sort of capacity at the moment. He says that he had not met Lutfur until about eight or nine months ago when Shiraj Haque persuaded him to do some work on the Yes for Mayor referendum in May. Ted this is a bit of a lame post, a councillor who has a political agenda wants to find out about some organisations dealing with the council, what’s the big news?. Cllr Peter Golds, our TH Wikileak is at it again. This time defaming local business people because they supported Lutfur for Mayor. My view is that there is nothing wrong with any supplier working for the council as long as it is done via the council’s procurement guidelines. It is vindictive and quite irresponsible of Cllr Golds to behave this way. We really need to question the motive of some of our nasty politicians and the length they are willing to go to gain power. My worry is that the Mayor will use back to back commercial events in Victoria Park over the summer to fund the Mela. There were 12 “Event Days” in 2009 effectively only one weekend in the Summer months without large sections of Vicky Park fenced off for private use. This without the noise nuisance and the crowds going to and from the park urinating in our front gardens of course those of us living near are not the Mayors core constituency, but some consideration would be nice. There is a motion to the Council meeting next week to limit the event days to six a year this seems reasonable. Shouldn’t the Labour leader be the mayor’s main critic as the chief (electorally humiliated!) representative of the main Opposition party instead of the ideologically unsettled and disturbed loony whinger Cllr Peter Golds?! Or are they (TH Labour group) all too busy mourning the premature death of their political careers whereby they have all become subjects of taxfunded uselessness?! To be fair, the Baishakhi Mela has been around for more then 10 years, and the Mela Committee led by Shiraj Haque has been organising it before the council muscled in and took it over in 2009. I think it is only right that the mela goes back into the community and it is organised by the Mela Committee and overseen by the council. It seems a lot of Ted’s leaks and stories are coming from Councillor Peter Golds, who seems to have far too much time on his hands and fast making a name for himself as a troublemaker. Does anybody know what Mr Golds does for a living? It is perfectly legitimate for business people to be involved in politics, they are also part of our community and make a significant contribution to our local economy. Councillor Gold’s constant harassment will only deter business people and the younger generation away from politics. We need to be inclusive and stop making assumptions that every businessperson wants payback. If a local company is fit to deliver and has the ability to win contracts through a legitimate process then we should encourage them to do business with the council. It reduces the carbon footprint and helps local regeneration. Of course we need to know who the council has extensive contracs with. Its our money for goodness sake. That is if you within the small band of Tower Hamlets residents that pay council tax. Could Takki be moonlighting for this firm? A man who appointed Sharon Shoesmith to head of childrens services in Haringey. A failed Labour councillor, who now pockets £120,000 of taxpayers money a year for spinning for his friend Lutfur Rahman. It would not suprise me in the slightest if when Lutfur knives Kevan Collins this joker gets the top job. Agreed, but i am not sure if this is the right way to go about it. Loony Peter seems to believe that all Bangladeshis are just corrupt. He is exploiting the weakness that envy and jealousy in the Bangladeshi community is so rife if anybody is bordering on success they will be pulled back at all costs. Peter our TH wikileak is now the medium every opposition is using for their dirty work. Shockingly, less then £2m a year of council’s fund is spent on small local business transaction and the rest with large corporations (there are more then 2000 small transactions per year from 500 small registered suppliers) so that is shamefully very little money going into our small business community. So it’s about time our councillors encouraged & supported more local business trade. It’s disgraceful that out of £388m per annum expenditure large corporations are getting £386m of the council’s money and only £2m is being spent on small local businesses. Something is not right, what will Cllr Golds do about that? Actually what has Cllr Golds ever done for his local ward, beside constantly whinge? The stuff about the Mela is pure speculation and until the shortlist is drawn up and/or contracts are awarded there’s no story. In terms of Media Link if you go to their website and look at their list of clients (use the – almost invisible – arrow to scroll down the list) it looks as if they have a contract to promote TH Social Services and Adoption and Fostering. Nothing wrong with that – these services need a lot of advertisements eg to attract foster carers and the size of the work (on top of the daily workload of the marketing/comms team) might require a specialist agency. Often councils will have a roster of approved contractors for a service (whose prices/service quality/standards meet their requirements) so that if there is a new contract they will ask the approved contractors to tender for it and select from one of them. This would be the case for cleaning services as much as marketing and communications. I don’t know if TH has an approved roster of marketing companies or if Media Link is on it. I don’t know why Media Link was informed of Peter Golds’ questions about their activities and that is a legit question. Lutfur’s fan club seem to be angry with Cllr Peter Golds. All he has done is ask some perfectly legitimate questions about contracts awarded by the council. These daft descriptions – “troublemaker”, “harassment”, “vindictive”, “defamation”, “disturbed loony whinger” – seem to indicate that they don’t like the fact that an opposition councillor is actually doing his job properly and effectively. If it is the case that those who have given financial and political support to Lutfur’s campaign are now being awarded contracts with Tower Hamlets, then the public have a right to know about it. Well done Peter for asking the questions, and well done Ted for publicising them! Andy the tactic used by Cllr Golds is incorrect, questioning is vital but leaking it to the press was not necessary at this stage. This all appears to be a scaremongering tactic, these people are being harassed because they supported Lutfur for Mayor, Cllr Golds tactic is to prevent them from applying. I ran a catering business and my customers use us mainly because of our good reputation of service delivery and our food quality. However if my local councillor is leaking unfounded negative news to the press then that will have a damaging effect on my reputation and ultimately my business. Leaking unfounded information to the press is quite irresponsible of Cllr Golds and if it were my business I would legally challenge him. Cllr Golds is just being spiteful and it shows the level of respect he has for the business community in the borough. Ali – If Media Link have nothing to hide, what are they afraid of? Why should their affairs be kept secret? It is not harassment or scaremongering – just accountability. I was questioning why it needs to be a news story? on December 8, 2010 at 2:59 am You couldn't make it up! Transparency and public accountability is why it’s a perfectly valid news story at any time. There are quite a few politicians and members of political parties who haven’t quite got their heads around accountability issues and freedom of information – although Cllr Golds does seem to understand that part of his job rather better than most. Comment by You couldn’t make it up! (AKA Cllr Josh) How is it news when nothing has really happened? The mela contract has just been advertised, that’s it. Stop black listing people for no reason. Let’s admit it. Some people are just jealous of Lutfur and his friends’ success, thanks to a warm Bengali, Somali and leftwing English electorate who like him more than they like others! Get over it. Who do you think should do the mela and why? Is Cllrs Golds English? He certainly doesn’t behave like one. Or is he related to that Wikileaks guy because they both like to create chaos using leaks as tactics to blackmail politicians and business people? Cllr Golds by this leaking act of political insecurity has shown that he isn’t a man but a mouse that lives off town hall garbage. Cllr Golds should resign as he is a disgrace. Doesn’t he know that all businesses generally undergo strict procurement procedures in councils. Exceptions are usually at government level like the defence contracts under the Tories. Cllr Golds should hide his own party’s rubbish first. And that includes Conservatives’ con tactics using student tuition loans to make mega-money for banks! What is all this hysteria about “leaks”? Exactly what is Cllr Golds supposed to have leaked? He is an elected representative with a duty to scrutinise the spending of public money. He asked questions to that effect. He was sent a reply. He sent me that reply because I could publish it to the wider audience of Tower Hamlets taxpayers. Similar Parliamentary questions and answers are tabled and published by Hansard every single day in the House of Commons. It’s called transparency, a relatively unknown concept in Tower Hamlets. How bizarre that people assume just because you criticise someone like loony whinger Golds that you automatically get termed Lutfurite! And if you criticise Lutfur you get termed racist or rightwing or Labour, but not get called Tory unless you are a foolish one man lonely show of Golds’ gross incompetence to win more than one seat in even the so called Tory Wapping! on December 8, 2010 at 3:08 am You couldn't make it up! It’s interesting to read that the MELA used to be run by the community without any assistance from the Council. At a time of very severe spending constraints which will be result in a considerable number of Council employees losing their jobs, one can only wonder what the priority is to fund this event as opposed to other public services which may be cut in next year’s budget. These sorts of events are the sort of thing which a lot of other Councils will be reducing expenditure on. Or maybe the cost of council services to the Festival are paid for from Festival Income – and hence there is no net cost to the Council Taxpayer in Tower Hamlets? I don’t know – but maybe other readers have the answer to that question? Shouldn’t we be asking why and to what extent this event is being funded by the Council as well as how the procurement process works? Also has there been any debate about the funding of this Festival by Members within the Council prior to the issue of the tender – within the context of setting the budget for next year? I wouldn’t believe a word Cllr Golds says. He is an attention seeker. Look at the way he got rid of ex-council officer Lutfur Rahman Ali. He has never questioned anyone else’s CVs in the council so why this chap’s? Is it because he was the first Asian senior recruit? Or is it because he didn’t want two Lutfurs running the council at the time as it was hard enough dealing with one?! Why this obsession with Lutfur? What is causing the likes of Golds so much personal and political insecurity? Fighting4EdMiliband your points are spot on. Cllr Golds behaviour towards the Bangladeshi community borders on racism more than anything else. I still would like to know what Cllr Golds actually does for the community that he is supposed to serve other than the one hour weekly surgery. I would personally campaign against Cllr Golds next time to ensure we don’t have such nasty politicians in our borough. Has Cllr Golds ever questioned about the big companies that are getting £386m of our money? No, he is more keen to ensure that the £2m spent with small local businesses also goes to the big boys. Now that Cllr Golds has been exposed, I would be surprised if he gets re-elected next time. What is more shocking is how Labour have allowed Cllr Golds to be the main Opposition spokesman in the town hall…classic case of electoral identity crisis! It would be very good for local businesses to be awarded contracts with the council, or for black and ethnic minority candidates to be appointed to senior positions for which they are suitably qualified. However, it is quite wrong for unsuitable candidates to be appointed, or for uncompetitive contracts to be awarded in return for political favours. There is very strong evidence that this was the case in the appointment of Lutfur Ali, and many suspect that such corrupt practices happen elsewhere in Tower Hamlets. It is perfectly correct for corruption to be exposed – indeed opposition councillors have a duty to scrutinise the activities of the mayor. It is a weak defence simply to refer to such legitimate activity as “looney” or “racist”.